Cable-stayed bridges have become the most popular structures for span lengths between 300 to 1000 meters. When I visited the Tatara Bridge in 1998, it was the longest cable-stayed bridge in the world with a main span of 890 meters. However, it will move to third place later this year with the completion of the 1018 meter Stonecutters Bridge in Hong Kong. 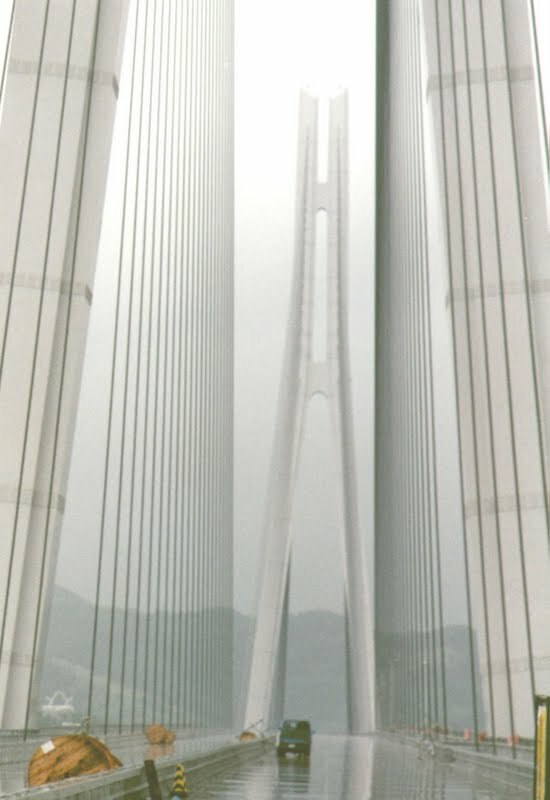 Currently, the longest cable-stayed bridge in the world is China's Sutong Bridge with a main span length of 1088 meters. Undoubtedly, it will eventually be replaced by an even longer cable-stayed bridge. Of course, cable-stayed bridges are dwarfed by the much longer suspension bridges. Currently, the longest suspension bridge is the Akashi-Kaikyo Bridge with a main span of 1991 meters. The Tatara Bridge was part of the project that linked the islands of Honshu and Shikoku with three expressways (the Akashi-Kaikyo Bridge was also part of this project). The project included 17 long-span bridges as well as many viaducts. The Tatara Bridge is part of the westernmost Nishiseto Expressway that includes nine long-span bridges and is 60 km in length. The Tatara Bridge has two, 220 meter tall steel towers. We rode up to the top in a special elevator that had wheels on its side to navigate the sloping bottom section of the tower. The deck carries two lanes of traffic in each direction along with pedestrian and bicycle lanes. Clearance below the deck is only 26 meters, preventing the Tatara Straits from being used as a shipping channel. The bridge has uneven side spans which resulted in using some reinforced concrete box girders to balance the weight. It was originally planned to be a suspension bridge, but was eventually changed to a cable-stayed bridge to reduce the environmental impact of excavating large anchorages into Ikuchijima and Ohmishima Islands. Cable-Stayed Bridges: Tatara Bridge by Mark Yashinsky is licensed under a Creative Commons Attribution 3.0 United States License.